A balanced, pragmatic point of view is all very well, but an extreme, polar position is so much more noticeable! There have been plenty of polar positions in the history of ELT, and for every polar position, there is the polar opposite. 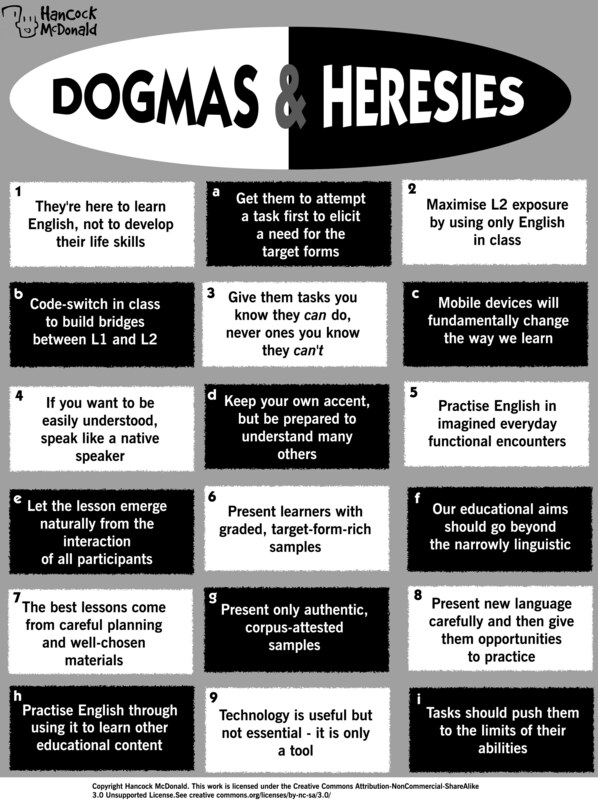 For example, the dogma "Use only the target language in class" opposes "Make use of the learners' mother tongue in class", the latter being a heresy with respect to the former. Meanwhile, the balanced pragmatist would probably find some virtue in both of the pole positions in the examples above, depending on the circumstances, and steer a course between the two extremes. In this game, there are a selection of polar positions in the white rectangles and the opposite positions in the black rectangles. Your objective is to match the two. Then, play the role of balanced pragmatist and decide to what extent and in what circumstances you agree with both positions. Download a pdf of the activity from here. Alternatively, find the jpeg below.